From the International Conference on Libya in Palermo. November 13, 2018. Picture by Alexander Miridonov/Kommersant/Sipa USA/PA Images. All rights reserved. Since the fall of Gaddafi’s regime in 2011, Libya has had three distinct electoral experiences, which have in turn given birth to three political institutions: the General National Congress (GNC), the Constitution Drafting Assembly (CDA) and the House of Representatives (HoR). However, neither the elections themselves nor the institutions that they created sufficiently stabilized the country. The former faced serious security and participation issues. Minorities, such as the Amazigh (Berbers), Toubou and Tuareg, were underrepresented and boycotted the electoral process, while in regions and cities controlled by extremist organizations like the Islamic State (ISIS) – for example Derna in the East and Sirte in the centre of the country – people were unable to vote. The latter in turn soon failed to live up to public expectations and did not meaningfully restore trust in politics on a more general basis. Rather, the GNC that was elected on July 7, 2012, only exacerbated the already existing political divide within the country by refusing to step down after the official expiration of its term. Even though the HoR was created as part of an initiative set forth by a GNC-committee itself, it did not eventually replace the GNC as was envisioned. Rather, the elections in June 2014 led to the rule of two opposing governments in Libya. The HoR moved to the city of Tobruk in the East and the GNC was reinstated in Tripoli. Additionally, the UN-brokered Skhirat agreement that was signed in December 2015 and aimed at a reunification of the Libyan governments unintentionally worsened the situation. As a result of the agreement, even more political bodies and institutions were created, the most important of which was the Presidential Council, whose nine members under chairman Fayez al-Sarraj now presided over the newly founded Government of National Accord. At the same time, the HoR that supposedly acted as the country’s legislative body refused to and still refuses to recognise the cabinet nominated by the Presidential Council and, moreover, allied with Khalifa Haftar, the Commander of the Libyan National Army. For the past two years, a number of international initiatives have tried to resolve the confusion and the political chaos that were created by all of this. Their most prominent proposal has been the call for early presidential and parliamentary elections, which has also been echoed in the resolutions of the Paris meeting of May 2018, in the course of which most of the important Libyan actors pledged to facilitate new elections by December 2018. To attain that, the relevant institutions in Libya are supposed to be supported by the United Nations Support Mission in Libya (UNSMIL). Similarly, the Palermo conference that was held in early November resulted in a new road map that envisions elections in the spring of 2019. However, these plans are criticized by various commentators as being too vague and utterly unrealistic in the face of a myriad of political and societal obstacles. As outlined in the BTI country report on Libya, the country’s “immediate challenges are security, the proliferation of militias and the expansion of violence, fuelled by economic crisis, rivalries between forces in the east and west, and by regional powers.” Given that “the conflict is intensifying, blocking potential for stabilizing the economy and revitalizing state institutions”, a call for early elections might in the end be utopian at best. And these are not the only challenges facing potential future elections. A central obstacle might be presented by the absence of any clear-cut legislative framework. As argued by Elhadi Buhamra, a member of the CDA, “there can be no elections without constitutional rule, because the constitutional declaration of 2011 has exhausted its amendments”. In that respect, Buhamra has suggested two solutions. The first would be to “amend the constitutional declaration to allow a fourth transitional phase”, which would in turn need a two-thirds majority in the HoR. The second would be to hold a referendum on the constitution. 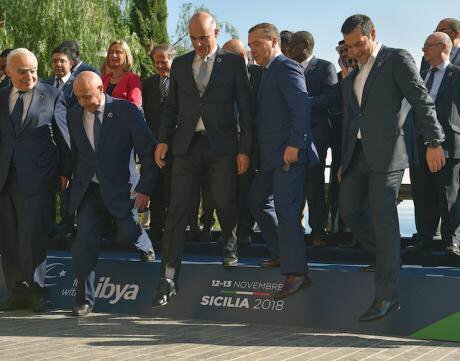 Given these fundamental hurdles to a meaningful electoral process in Libya, international conferences alone, such as those recently held in Paris and Palermo, will most likely not be able to overcome the political crisis in Libya. While they are part of a potential solution, a sustainable resolution of the political divide and the security unrest in Libya, which have taken hold of the country since the fall of Gaddafi’s regime, will certainly require the cooperation of politically relevant elites inside of Libya. After all, initiating a more decisive Libyan-Libyan dialogue with UN support might be the only way to move forward.